Category: Shiromi (white fish). Season: late spring and summer. Ayu is a a freshwater fish - it is a member of the trout family, and is not a traditional Edomaezushi neta. 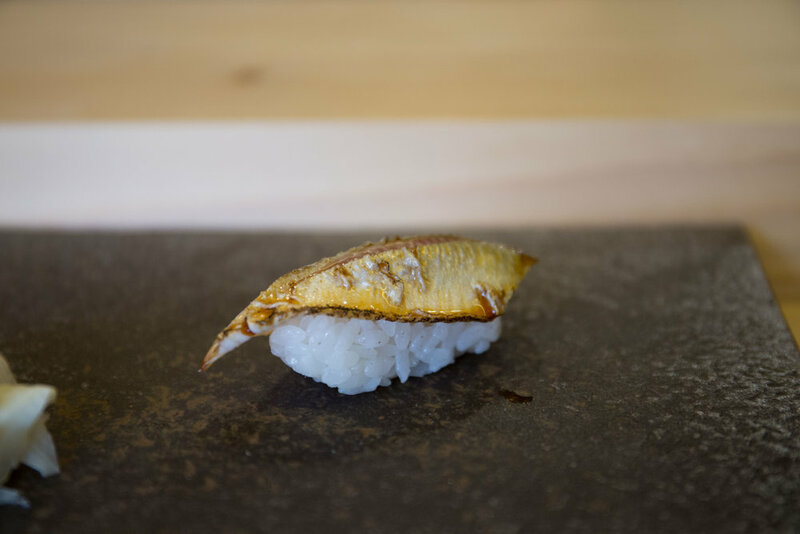 However, it has long been used in other parts of Japan to prepare nama narezushi, where the whole fish is packed in rice and allowed to ferment for an extended period of time. It is also a summertime seasonal staple of kaiseki ryōri cooking, where it is salted, grilled, and served skewered. But again, you will not typically find this fish served at traditional Edomaezushi shops. Less orthodox shops that do use it as nigiri neta will serve it grilled or aburi, as pictured above. It has a delicate flavor and very soft texture.